Mark Guy Pearse (1842–1930) was a Cornish Methodist preacher, lecturer and author who, during the last quarter of the 19th century and the first of the 20th, was a household name throughout Britain and beyond. Born at Camborne, he entered the Wesleyan ministry in 1863 and for over twenty years served as a minister in Leeds, Brixton Hill, Ipswich, Bedford, Highbury, Westminster, Launceston, and Bristol. A Christian Socialist and Temperance campaigner, his ecumenical sympathies gained him the friendship of the Baptist preacher Charles H. Spurgeon and the American evangelist Dwight Moody. From 1870 until his death he published more than forty books, often stories of Cornish life, as well as numerous booklets, tracts and articles, most of which had a worldwide circulation. The best-selling Daniel Quorm and his Religious Notions was read by all levels of society and was much admired by Queen Victoria. In 1886 he accepted the invitation of Hugh Price Hughes to join him in the West London Mission, which was established to minister to London’s most needy. Pearse made extensive tours abroad to publicise the aims and achievements of the Mission and to raise money. These tours brought him into contact with Cornish communities in North America, Australasia and South Africa. After retiring from the Mission in 1903, he continued to preach, lecture and write, spending more and more time in Cornwall. Four months before his death in 1930 he was made a bard of Gorseth Kernow (the Cornish Gorsedd) at Carn Brea, taking the name Pyscajor a Dus (Fisher of Men). 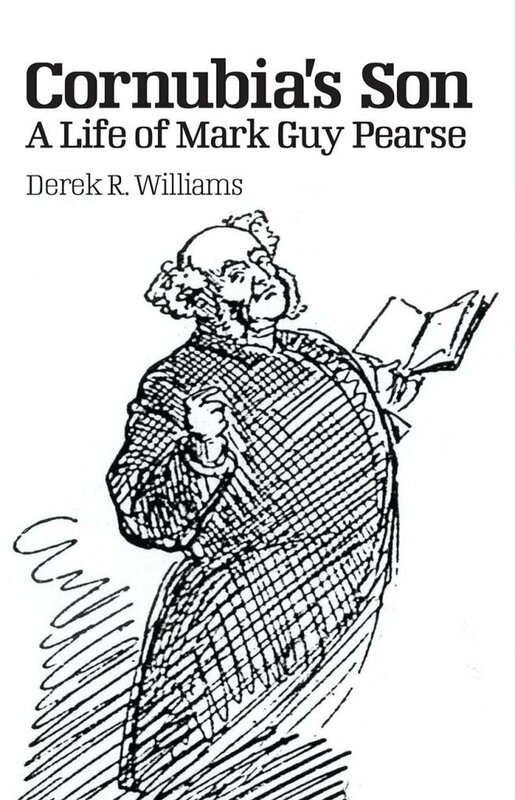 Derek R. Williams was born in Cornwall. He is the author of Prying into Every Hole and Corner: Edward Lhuyd in Cornwall in 1700 (1993), A Strange and Unquenchable Race: Cornwall and the Cornish in Quotations (2007), and many articles on Cornish subjects. He is the editor of Henry and Katharine Jenner: A Celebration of Cornwall’s Culture, Language and Identity (2004) and co-editor of Setting Cornwall on its Feet: Robert Morton Nance 1873–1959 (2007). To my shame, although I have known of Mark Guy Pearse for over 40 years, his most famous novel Daniel Quorm is amongst my books and in the early 1980s a centenarian told me of how he had heard him preach in London, I have not read much about him. That omission has now been corrected by this book. And how! The author acknowledges the assistance received from many people over the past decade. This indicates the depth and the width of his research, resulting in a fascinating and full biography of a great man. It describes the many talents of this Cornishman, brought up in the county’s mining heartland, who felt called to turn from a career in medicine to the Wesleyan Methodist ministry. He became a celebrated preacher, serving in a variety of circuits before settling to seventeen years of pioneering ministry, which was initiated by his senior colleague, the Revd. Hugh Price Hughes, in the West London Mission. He was multi-talented, gifted as an artist, skilled in the use of words in speech, prose and poetry. As a splendid raconteur he possessed the ability to observe and remember people and incidents, a gift well-used in the many books he wrote. Although ill-health dogged his ministry from time to time, he possessed untiring energy, travelling widely. His preaching style drew great crowds and his books were read world-wide and by people from all classes, including Queen Victoria. This story of his life will appeal to various groups. It will appeal to Cornish Methodists for it is about one of their own and many references to people and places familiar to them will stir their memories. It will appeal to those desirous of knowing what life for the Cornish was like, particularly in the mining areas in the latter half of the 19th century, It will appeal to those wishing to know about the social outreach of Wesleyan Methodism in the deprived areas of inner cities, work centred not in magnificent chapels but in mission halls. It will appeal to those curious to know how the Cornish way of life, and Methodism, was sustained by those who emigrated to far-away places, visited by Mark Guy Pearse as he travelled around the turn of the century to North America, Australia, New Zealand and South Africa soliciting support for the Mission. The author tells the story well, not only recounting the life of one who came to have a great public profile, but setting it against the background of the cultural changes of the period. It is social history and provides an understanding of the changes – not always easily accepted experienced in Wesleyan Methodism, especially resulting from the Forward Movement. Although at times there is too much by way of small detail, nevertheless it is an excellent, informative and challenging book.